How can YOU beat the Summer Slide? We are thrilled to host author Tim Green on October 6th 2014! On October 6, 2014, local author and former NFL player, Tim Green will visit and speak with students in grades 3-6. His visit, sponsored by an anonymous donation, will be extra special as we will celebrate the release of his newest book, “First Team”. Featured in the book are two characters known to some in our region. In an attempt to select names for characters in his book, Tim held a contest on Facebook as he was preparing to write “First Team”. Two submissions were selected, one being the father of Moravia resident, Sandy Hatfield, and the second, the father of Moravia resident and member of the faculty at Millard Fillmore Elementary School, Corey Wasileski. Over the next few weeks, students in grades 3-6 will be asked to prepare a written piece with the theme of sportsmanship and teamwork. Written pieces will be judged and those selected will receive three of Tim’s books as well as a chance to have them autographed over lunch with him. 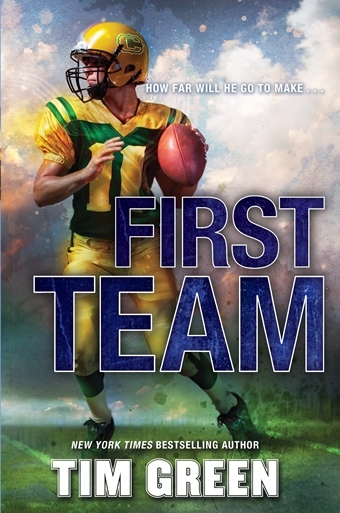 Tim and his family also have generously donated a copy of “First Team” to each member of the 3rd, 4th , 5th and 6th grade classes!! We will also designate 10/6 as “Green” day and ask that everyone wear green in his honor. In preparation for the event, if you read with your child at home, it would be great if you selected one of Tim’s books to read. We also have copies available in our library here if your child wishes to check one out prior to Tim’s arrival. We look forward to Mr. Green’s arrival in a few weeks.